Best 2009 original soundtrack (OST) ? You said rock'n'roll soundtrack ? Last Tuesday evening, I went to theater to see "The Boat That Rocked".I had no particular idea of what the film was about. All I knew was : brittish comedy, very refreshing... a friend of mine who works in a theater told me "you should go, everybody seem to be happy when going out". 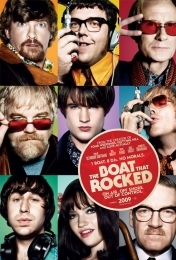 I think it was the best idea I had for a few weeks, at first we were decided to go and watch the last Pedro Almodovar movie but we arrived a bit late so, as I really hate to miss a single minute of the beginning of a movie, we finally tried "The Boat That Rocked". But best of all, the soundtrack OMG !!! I can not imagine the selection audio work for this movie but all I can say is "you rocked" ! Return from "You said rock'n'roll soundtrack ?" to Home ?